How are you? I thought it's time to go back to normal and focus on fashion again. I had today's outfit in my wardrobe for a while and it is one of many which I need to take out more. The delicate chiffon blouse from Joy is teamed up with a Union Jack clutch and soft, black shorts from Forever 21. Sunnies and ballerinas complete the look, which I think is super chic and eye catching for a shopping spree in town or coffee with the girls. Hope you'll have fun and enjoy today's ootd. Late spring is a wonderful time. The days get longer, the weather finally warmer. You can sense a tiny hint of summer in the air and for those days, which tend to be chilly in the morning, but built up a decent heat in the day, it is best to dress appropriately. With this outfit, I have combined a light blouse which is perfect for the warm weather but tights make sure I'm not freezing in the morning. These days I hardly leave the house without a good pair of shades. This accessory makes me even more excited for summer and have you ever caught yourself to feel a bit mysterious? Am I looking at you? Am I looking somewhere else? Who knows! Instead of overloading the look with a massive handbag, I've decided to go with a small cross body bag which you can also wear as a clutch. My little Union Jack bag is from Primark and I had it since 2009. I remember that I wasn't sure at first when I saw it in the Oxford Street branch, but the price of £6 plus it was selling fast made me make my choice. It has been a loyal companion ever since. So, I'm all glammed up now and ready to go. Can someone please take me out? Thank you so much for reading today's post and I hope you'll be joining me on my next adventure. What's your favourite outfit to hit town? Would love to see it, so if you have a similar post, leave me a link in the comment section or send me a pic via Twitter. 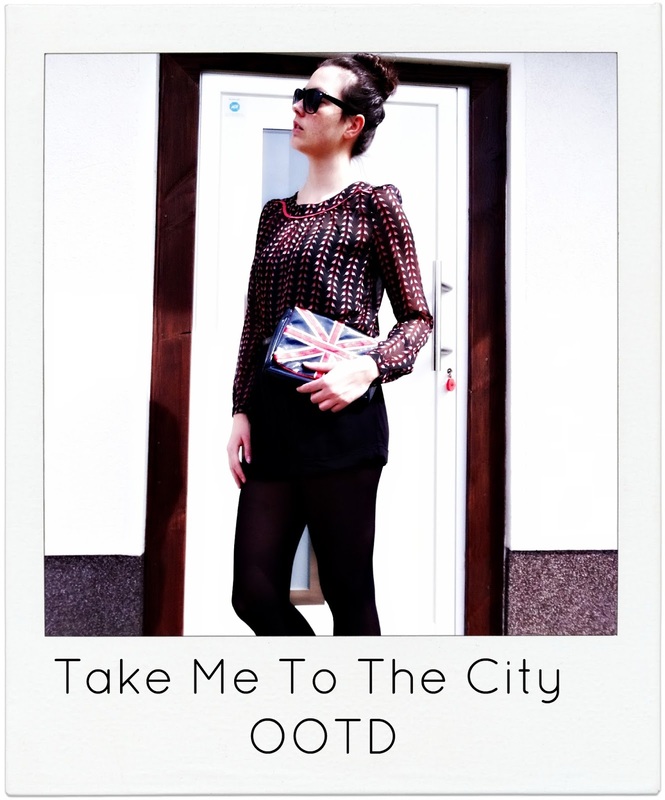 If you like my style posts, you may be also interested in my recent Topshop OOTD style post.